The Rockland County YMCA is now conducting Spring Registration for its swim lessons and youth sports programs. Everyone into the pool! The YMCA will offer a range of swimming lessons for all ages and abilities beginning February 26 – April 15. Swim Starters lessons for parents and children ages z – 24 months & children 2 – 4 years old are conducted on Saturday and Sunday mornings. Swim Basics for pre-school children 3 – 5 years old and School Aged children 6- 12 years old are conducted on weekday afternoons and weekends. There are also Swim Stroke Classes for more advanced swimmers ages 6 – 12 years old; and Adult / Teen classes for 13-years and up for beginners and intermediate swimmers. 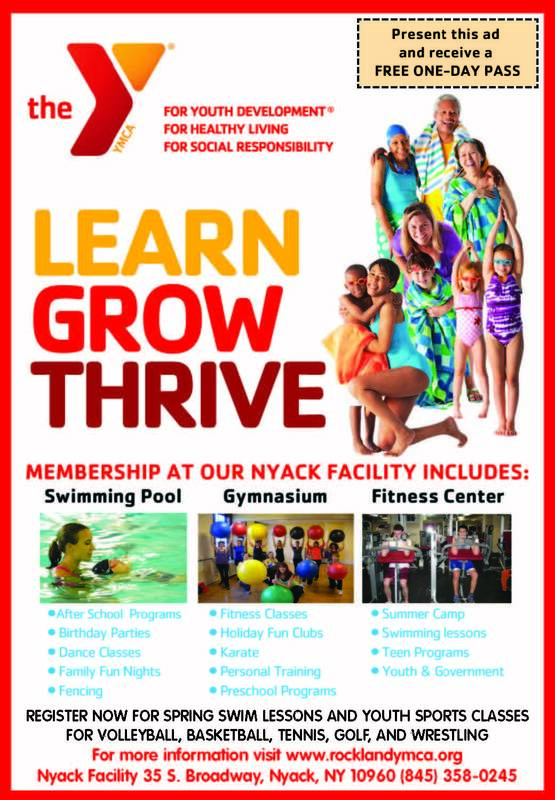 More information about group and private swim classes with specific days and times is available at the YMCA website www.rocklandymca.org. Those interested are also invited to stop by to meet with the YMCA Aquatic Director Jessica Keavney or Joe Pica Aquatics Coordinator at the swimming pool located at 35 South Broadway in Nyack. Spring Youth Sports Programs – registration now open for: basketball, volleyball, wrestling, tennis, and golf for a variety of ability levels & age groups 5 – 17 years old. PContact Phil Donnelly, VP of Health & Fitness for more information 845-358-0245.